We believe that making our facilities safe and comfortable for all passengers, especially the elderly or physically challenged, is an important part of our service. Therefore, we are working to make our facilities barrier-free. 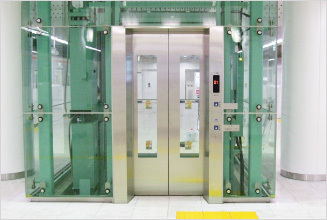 For example, elevators and escalators have been installed to make access from ground level entrances to platforms and station passages smooth and easy. 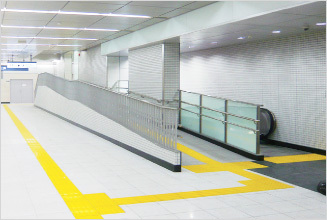 Slopes, guide blocks for visually-impaired people and Braille information boards have been installed as well. We are implementing a range of measures to ensure that all passengers can use the stations comfortably. 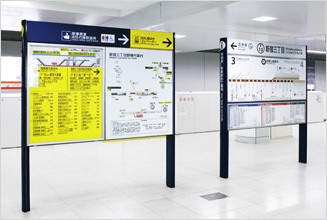 These include the introduction of an easier-to-understand sign system (information displays) providing information on train transfers and destinations above the ground, and the installation of intercom sets that enable passengers to call station attendants immediately in case of an emergency. All our stations are also equipped with automatic external defibrillators (AEDs) that can be used in case of medical emergencies. We are not only ensuring safe and secure train operations, but are also listening to comments from each of our customers to increase the comfort of our services. 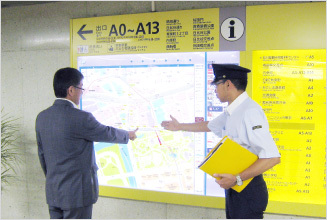 We have assigned Service Managers to a total of 14 stations, including Ueno and Nihombashi. The Service Managers provide information about the station itself and surrounding facilities and assist with ticket purchases, etc. Furthermore, as a part of these efforts we have developed leaflets for foreign customers and a foreign language website, both available in four languages, which explain how to use Tokyo Metro and provide information about Tokyo’s sights. Our aim is to have restrooms that are comfortable and easy to use by continually recognizing our customers’ needs. Here, we introduce some of the restrooms designed to fit each station’s image. These restrooms, which targets the younger age groups, brings out the feeling of love and passion. The exterior wall of light creates a transparent and refined space. These restrooms were designed to capture the atmosphere of current day Nihonbashi, a mixture of historical Edo period and modern architecture. These restrooms were designed to show Kagurazaka’s alley-like atmosphere by using Japanese color and historical design cues such as checkered patterns and stone pavement-like material.